Comprehensive Cancer Centres (CCCs) are healthcare facilities – or their associations – which fulfil the criteria of providing healthcare to cancer patients, as declared by the Czech Society for Oncology. Where will I find information about a specific CCC? The map containing information on all CCCs in the Czech Republic is available on this page. The required information can be obtained with several mouse clicks. How can I use the map of cancer care? Comprehensive Cancer Centres (CCCs) make only a fraction of the healthcare facilities which are involved in the care of cancer patients. An interactive map provides a comprehensive overview of this network. What are the principles of cancer prevention? There are many general recommendations as well as targeted cancer screening programmes. Where will I find information on cancer epidemiology in the Czech Republic? The information portal Epidemiology of malignant tumours in the Czech Republic provides detailed statistics on cancer epidemiology in this country. Brothers of Mercy Hospital, a.o. EUC Health Centre Brno Ltd.
Uhersky Brod City Hospital and Health Centre, Ltd.
Hospital Ledec - Haj, Ltd.
Oncology of Kutná Hora, Avicennus Ltd.
Sanatorium of Jaroslav Bilek, MD, Ltd.
EUC Health Centre Liberec Ltd.
Plzen City Hospital, Privamed, Inc.
Hospital and Health Centre Roudnice n. L., Ltd.
Duchcov City Hospital - Vita, Ltd.
Miners' Hospital and Health Centre Bilina, Ltd.
Krusne Hory Health Centre, Ltd.
EUC Health Centre Usti nad Labem, Ltd.
Home of Peaceful Ageing, Ltd.
First Czech Medical Society, Ltd.
Institute of Oncology and Rehabilitation Ples, Ltd.
EUC Health Centre Kladno Ltd.
Gastroenterology Outpatient Clinic - L. Kudlej, M.D. Private Gastroenterology Centre - Petr Richter, MD, Ltd.
Gastroenterology Marek Rehor, M.D., Ltd.
Hospital Jablonec nad Nisou, a.o. Gastroenterology Outpatient Clinic - CL, Ltd. Private Gastroenterology Outpatient Clinic - P. Marten, M.D. Gastro-Med, Ltd. - R. Bužga, M.D. Digestive endoscopy, Ltd. - K. Paiger, M.D., Ph.D.
Gastroderma, Ltd. - M. Fratric, M.D. Gastro-Med, Ltd. - R. Buzga, M.D. Gastroenterology Outpatient Clinic - Marcela Vyslouzilova, M.D. Private Gastroenterology Outpatient Clinic - B. Pokorna, M.D. Private Health Care Facility EGK, Ltd.
Gastroenterology Outpatient Clinic – Petr Mikolas, M.D. Gastroenterology Outpatient Clinic – Jaroslav Kratochvil, M.D. District Hospital Mlada Boleslav, Inc.
Hospital Nove Mesto na Morave, a.o. Frantisek Kazda, MD - Gastroenterology, Ltd.
Endoscopic Surgery, Ltd. - L. Man, M.D. Gastroenterology Outpatient Clinic - H. Junkova, M.D. Czech-German Mountain Hospital Krkonose, Ltd.
Hospital of Follow-up Care Ryjice, allowance org. Monse, Ltd. - J. Dosedel, M.D. 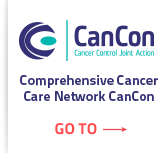 RADION - Oncology Outpatient Clinic, Ltd.
New version of this website has been developed since 2014 as part of the pilot project of the Comprehensive Cancer Care Network, which is a contribution by the Czech Republic to the Cancer Control Joint Action (CanCon).